with Carole Costantini, Pierre Laneyrie, Lucas Lemaire, Chloé Martinon, Alexis Moati, Léopold Moati set design Thibaut Vancraenenbroeck musical composition Léna Chambouleyron audio composition Josef Amerveil set construction Atelier de la MCB° Maison de la Culture de Bourges - SN assistant director Thibault Pasquier costumes Aude-Claire Amédéo assisted by Laure Ugheto lighting Pascale Bongiovanni executive production Espace des Arts - SN Chalon-sur-Saône production Espace des Arts - SN Chalon-sur-Saône, Cie Vol Plané co-production La Gare Franche - Marseille, Le Merlan - SN de Marseille, Théâtres en Dracénie - state approved for dancing - Pôle régional de développement culturel, Pôle des Arts de la Scène - Friche la Belle de Mai - Marseille with support from the Fonds d’Insertion pour Jeunes Artistes Dramatiques, de la DRAC et de la Région SUD. Alexis Moati is an associated artist at l’Espace des Arts, SN de Chalon-sur-Saône during the 2018/19 Season. This is an unforgettable portrayal of family life behind closed doors. Intimate and political, as intense as a Greek tragedy and light as a television series, this play tells the story of a household inspired by the utopia of May 68: their dreams, their aborted revolutions and the emancipation of a son who wants to change the world with his piano. Alexis Moati’s piece immerses us in a daily life filled with moments of pleasure, grandma’s recipes, political debates, teenage romance and a passion for music. The question is, what to do with what is transmitted to us? Who do we then transmit it to? 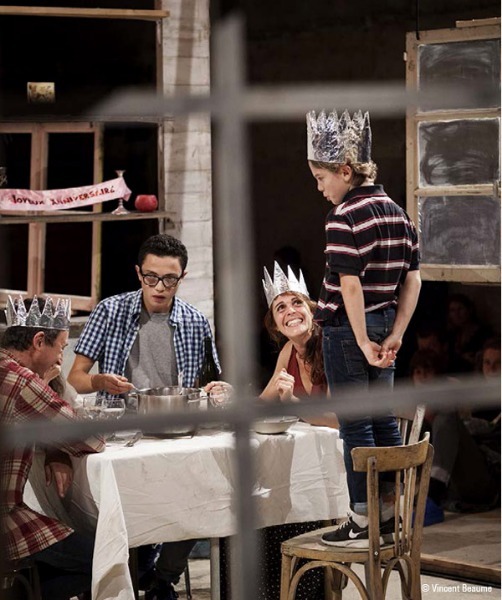 The company vigorously takes on the quirky and humorous writing of young author Quentin Laugier in a compelling invitation to forget neither the precariousness of human relations nor the importance of coming together as one big family. A thrilling theatrical exploration of the children from a generation that wanted to change the world. Influenced by 60’s American cinema, a group of actors tell their stories with infectious energy.